Ceci est la version publiée, vérifiée le 4 décembre 2018. Il y a des changements de modèle ou de fichiers en attente de relecture. Sappho is the only woman writer ever whose work was immediately celebrated and has been renowned through the ages. All the while, Sappho the woman remained notorious: no other writer has provoked anything like the countless biographical fantasies that Sappho inspired. Sappho’s contemporaries and near contemporaries spoke of her as “the poetess,” the female counterpart and presumably the equal of “the poet,” Homer. Since then, however, Sappho has been far less fortunate than her male counterpart. The bulk of her poetry was lost: only a handful of poems have come down to us in something like integral versions; otherwise, only fragments survive. And her poetry has often been eclipsed by her legendary person. The Sapphic corpus we know today was rediscovered gradually over the centuries. Modern readers truly gained access to Sappho’s work in the decades between 1546 and 1566 when a corpus was first constituted in print. Robert Estienne’s 1546 edition of Dionysius of Halicarnassus included the Greek text of the poem popularly known as “The Ode to Aphrodite” (fragment 1, the only poem always considered complete). That same year, fragment 31 (familiarly known as “Peer of the Gods”) was published both in Basel by Robortello in his edition of “Longinus” and in Venice in Muret’s commentary on Catullus. In 1556, fragment 31 was first translated into French by Rémi Belleau. And in 1566, Robert Estienne’s son Henri included the two odes and almost forty fragments along with Latin translations in his edition of Greek lyric poets. Sappho had acquired what was essentially the corpus for which she was known until Christian Wolff’s 1733 edition and prior to the discovery of additional verse fragments beginning in the 1890s. She soon became accessible to readers who did not know ancient languages. Her corpus was published in French in 1670 by Jacques Du Four de La Crespelière and in 1681 in Anne Le Fèvre Dacier’s highly influential Poésies d’Anacréon et de Sapho. In the course of the 18th century, translations appeared in other European languages. By 1681, Sappho had also acquired a biography. Almost nothing is known for certain about Sappho’s life other than her birth on Lesbos. About two centuries after her time, speculation about her sexuality first appeared in old comedy: there, she was portrayed as heterosexual. 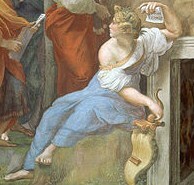 The original commentary about Sappho as a lover of women dates from the Augustan age, when the most influential fiction of all time was composed, the fifteenth epistle of Ovid’s Heroides. Ovid included virtually every element that subsequently inspired the legends about Sappho that proliferated as knowledge of her œuvre spread. Henri Estienne prefaced his 1566 edition with a “Sapphus Vita.” But what he proposed as Sappho’s biography was largely copied from Gregorio Giraldi’s 1545 version, which had been taken mainly from Ovid. Over the centuries that followed, scholars occasionally contested this fictionalized biography: in his 1664 Abrégé des vies des poètes grecs, Anne Dacier’s father Tanneguy Le Fèvre dismissed most of these legends, in particular, the story promoted by Ovid of Sappho’s betrayal by a man named Phaon, a betrayal that allegedly caused her to commit suicide by leaping from a cliff. But Le Fèvre was a rare exception. For the most part, everyone from Sappho’s translators to noted Hellenists promoted often outrageous visions of Sappho, usually based on literal readings of her poetry. These myths varied from country to country, from century to century – and each was shaped by contemporary views on women and female sexuality. Thus, whereas for most of the 18th century Sappho’s suicide because of Phaon was taken for granted, 19th-century German Hellenists contended that she was chaste, while French authors from Baudelaire to Louÿs presented her as a lesbian. Sappho has been portrayed as mad, as a courtesan, as hideous, gorgeous, an oversexed heterosexual, an equally oversexed lesbian, more often than not, as a scandalous woman whose story violated contemporary standards of decency. Martin L. West (Times Literary Supplement, "A new Sappho poem", 21 june 2005) says that "only sixty-three [fragments] contain any complete lines; only twenty-one contain any complete stanzas; and only [four give] us poems near enough complete to appreciate as literary structures". Two of those poems were wellknown during the Ancient Régime: fragment 1, recorded by Dionysius of Halicarnassus' treaty entitled On Literary Composition, and fragment 31, found in Pseudo-Longinus' treaty On the Sublime. M. L. West considers that lineaments of fragment 16 are also readable. Fragment 58, almost complete, has been newly reconstructed, in 2005 . Several fragments (from one word to a few lines) were re-discovered during the 16th century as quotations amongst other texts (Pseudo-Longinus, Athenaeus' Deipnosophistes...). But Sappho's poetry noticeably gained in volume thanks to archeological discoveries in Egypt (the wellknown Oxhyrhynchus Papyri , published since 1898. This bibliography deals only with Sappho's reception since the 16th century, mainly in France. Major works about Catullus' imitation of fragment 31 or about Sappho's early reception for instance are to be found in other bibliogaphies. Aulotte, Robert: - "Sur quelques traductions d'une ode de Sappho au XVIe siècle", BAGB (Bulletin de l'association Guillaume Budé), 1958, p. 107-122. - La fortune d'une oeuvre de Sappho au XVIe siècle", BAGB, 1960, p. 444-446. - "L'Ode à l'Aimée chez Robert Garnier", BAGB, 1965, p. 112-117. Baader, Renate: "Wider "lys et roses": Mademoiselle de Scudéry Rede Sapho à Erinne", Lendemains, XVI, 61, 1991, p. 12-27. Brunet, Philippe: L'égal des dieux, cent versions d'un poème de Sappho, Paris, Allia, 1998 [translations and imitations of Sappho's "Peer of the Gods" in French literature]. DeJean, Joan: - Fictions of Sappho, Chicago, University of Chicago Press, coll. Women in Culture and Society, 1989 [traduction française par F. Lecercle, Les fictions du désir, Paris, Hachette, 1994]. - "Portrait of the Artist as Sappho", in Germaine de Staël. Crossing the Borders, ed. Madelyn Gutwirth, Avriel Goldberger, Karyna Szmurlo, New-Brunswick, Rutgers University Press, 1991, p. 122-137. Greene, Ellen (ed. ): Re-Reading Sappho: Reception and Transmission, Berkeley, University of California Press, 1996. Huchon, Mireille: Louise Labé. Une créature de papier, Genève, Droz, 2006. Krief, Hélène: La Sappho des Lumières, Publications de l'Université de Saint-Étienne, Saint-Étienne, 2006 [texts about Sappho, from 17th to 18th c.]. Reynolds, Margaret (dir. ): The Sappho Companion, Palgrave Macmillan, 2002. Rigolot, François: "Louise Labé et la redécouverte de Sappho", Nouvelle revue du XVIe siècle, 1, 1983, p. 388-391. Steinrueck, Martin: "Sappho sans sa vie", in Biographie des hommes, biographie des dieux, Marie-Laurence Desclos (dir. ), Grenoble, Recherches sur la philosophie et le langage, "Cahier-21", 2000. This entry was made in collaboration with Anne Debrosse. Dernière modification de cette page le 4 décembre 2018 à 17:14. Cette page a été consultée 21 602 fois.